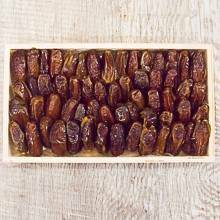 This crate is filled with Deglet Noor Dates that are lightly sweet, full of nutty flavor, and make an excellent gift for any date lover. They are high in dietary fiber, are chewy, and delicious. They are low in fat, cholesterol, and sodium, which make these dates a smart choice for healthy living. Add them in cereals, nut mixes, or eat them as a snack anytime. Packaged in a 14 oz. wooden crate.